The DD Audio 12 inch Evolution Subwoofer Package (ESP) has arrived and is very literally ready to rumble. 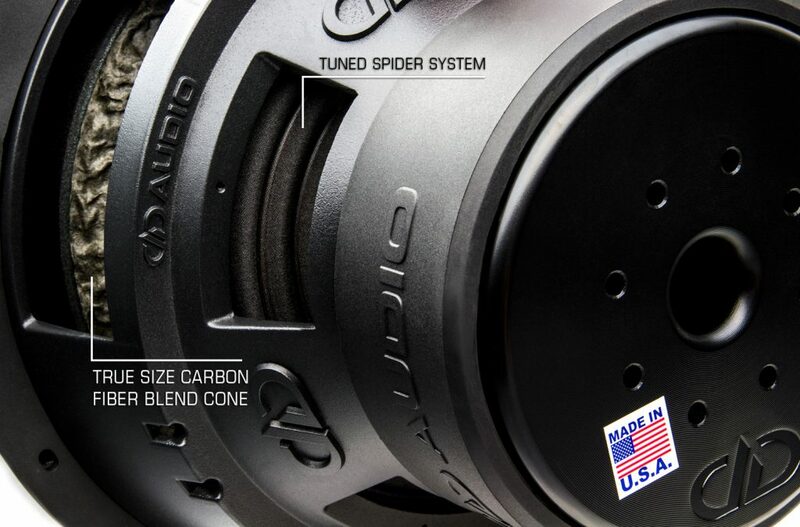 Featuring staple DD Audio innovations like the Super Frame (SFrame), Vario-density Extended Range Of Motion Surround (V-ROM), True Size Carbon Fiber Blend Cone (CFB) technology, and Tuned Spider System (TSS) technology; the 12 inch ESP is set to deliver more performance than any other 12 on the market. At first sight of the 12 inch ESP envious onlookers will marvel at its unique and stylish features. Each handmade subwoofer comes standard with a handmade dry carbon fiber dustcap that provides unprecedented durability and style without sacrificing performance. In combination with the beefy surround and newly updated gasket, the 12 inch ESP let’s you know it means business before a note is ever played. Under the hood of the aggressive and stunning face of the woofer lies the precision laser cut Tuned Spider System. Housed within the comfort of the SFrame’s high ceilings, these spiders have more room to move than any other that came before them. Working alongside the expansion jointed V-ROM Surround to guide the lightweight hi-temp coil along its straight and narrow path, the Tuned Spider System lends a major hand in doing what the ESP does best: Defining the meaning of linear excursion while producing more output than any other subwoofer. Period. The ESP 12 inch will be available in the 3012, 3512, 9512, 9912 and Z312 (coming soon) formats. Head over to your local DD Dealer today to see (and hear) for yourself!